The Washington Post have published an article that explores alternative methods for mapping elections. "Toward a more perfect 2016 presidential election results map" does an excellent job of establishing the problem of mapping totals in massively different geographical units. They don't really explain you have to normalize the totals but, instead, leap to the population-equalizing density cartogram as one alternative before quickly dismissing it as hard to read. They then offer a map that takes precinct level data and scales the results by number of votes. What they seem to have done is created a proportional symbol map with very small circular symbols that have been scaled across a ridiculously small size range. They've used a lot of transparency to allow overlapping symbols to build a composite patch of more opaque colour in areas with a lot of small geographical areas. This is pointilist cartography (note, I said pointilist, not pointless). Proportional symbol maps are not new. Neither are dot density maps. This version isn't particularly innovative but it does do a very good job of mitigating the perceptual problems of widely varying geographical areas. Each place gets the same symbology treatment and, so, the map provides a well balanced mix of red and blue with a lot of white space in between. They used a symbol treatment that goes from red through white to blue with the intermediate colours reserved for marginal precincts. I like this approach. It avoids the unusual purple often used for areas that are finely balanced. 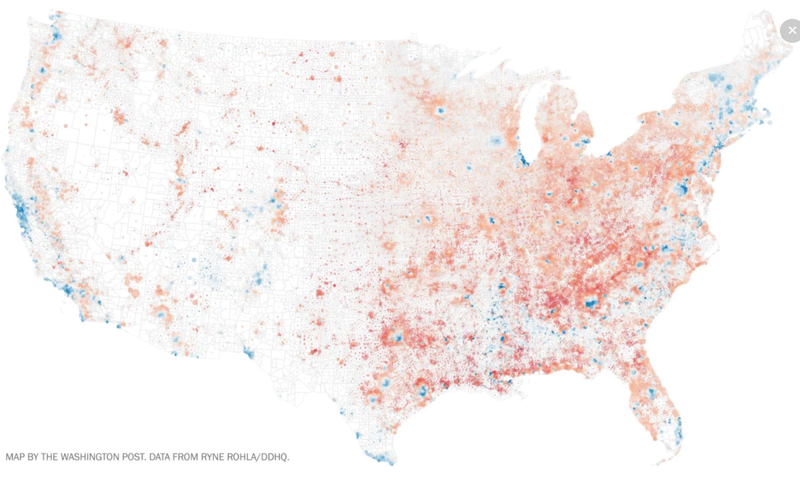 It means the map brings focus to those areas that are more partisan. Of course, with a shift in the symbology you could bring focus to marginal areas if that was the map you wanted to show. A similar approach is to use solid fills for small areas and then show larger areas as small circular symbols. Mixing the techniques on a single map can be useful and also mitigates the visual impact of large areas. Here's an illustration using the technique that I recently made for my forthcoming book. The top is a standard choropleth with a diverging colour scheme. The bottom is the pointilist version. So, overall I really like this kind of approach to deal with perceptual issues. But the article does hide a more interesting problem. The opening paragraph is at pains to say we've been over this ground before. We have - ad nauseam. Yet so many prefer the standard choropleth and, worse, sometimes with totals. But when they suggest it's a problem for the 'designer' that's where the real problem lies. Everyone these days is a bloody 'designer'. But everything is designed. I always balk when someone tells me they're a designer. A designer of what precisely? Furniture? Buildings? UI? Maps? A cartographer knows how to map election data. They know the problems and they know the solutions that best deal with particular visual issues to get to a map that matches a particular narrative. Far too many 'designers' are busy scrambling to try and figure out how to overcome problems that have already been figured out. Talk to a cartographer. That's their job. They know what they're doing and likely have a good solution. Pointilist cartography isn't new. I'm pleased to see articles like the one I note here picking up these techniques. I just hope they get used a little more rather than being marginalized by 'designers' who default to the standard choropleth.